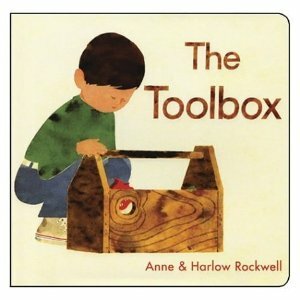 The Toolbox by Anne & Harlow Rockwell features a wooden toolbox that is identical to the common classic tool totes we often build early on with our kids. They are timeless and classic. This board book (not real wood, but cardboard for young hands) has 24 pages that feature the contents of the toolbox and the jobs they do. The drawings are clear, yet simple without any background clutter. My son at 2yrs old loves this book. The focus on hand tools is nice. Hand saw, hand drill, claw hammer, bench plane, wrench, folding ruler, pliers, oil can and a few others are all covered.